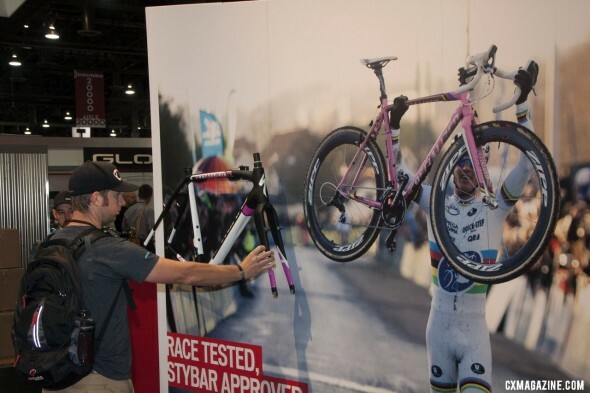 If you have any doubt that Specialized has fully embraced cyclocross, the giant Zdenek Stybar photo and new 2013 carbon S-Works Crux cyclcoross frame display that dominated the company’s Interbike 2o12 booth would convince you otherwise. 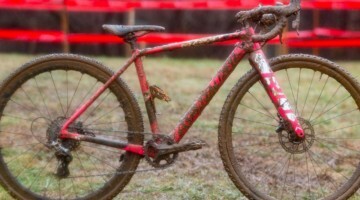 Now that the California-based company boasts six Crux frame options and five cyclocross tire tread patterns to choose from, it’s clear that Specialized is committed to meeting the needs and budgets of nearly all ’cross racers. After sponsored riders 2010 National Champion Todd Wells and Zdenek Stybar raced Specialized E5 aluminum Crux frames to major wins, and having received valuable feedback on the aluminum Crux from Ned Overend and the Cal Giant Berry Farms team, Specialized has settled on a Crux geometry for its new carbon models, and brings four carbon fiber Crux models to the market for 2013, replacing last year’s Crux-badged carbon Tricross frame. Designed to be a Tarmac on dirt, the carbon Crux cyclocross models features a geometry that includes relatively short 42.5cm chainstays and a low bottom bracket that we praised in our positive review of the 2011 Crux Comp in Issue 11. For the most part, the carbon models inherit the exact same geometry of the original aluminum Crux models, with the exception of a slightly-shortened seat tube (by 1cm on a 56cm frame) and a smaller tapered fork steerer that was reduced from a maximum diameter of 1-1/2″ to 1-3/8″ for all 2013 models. 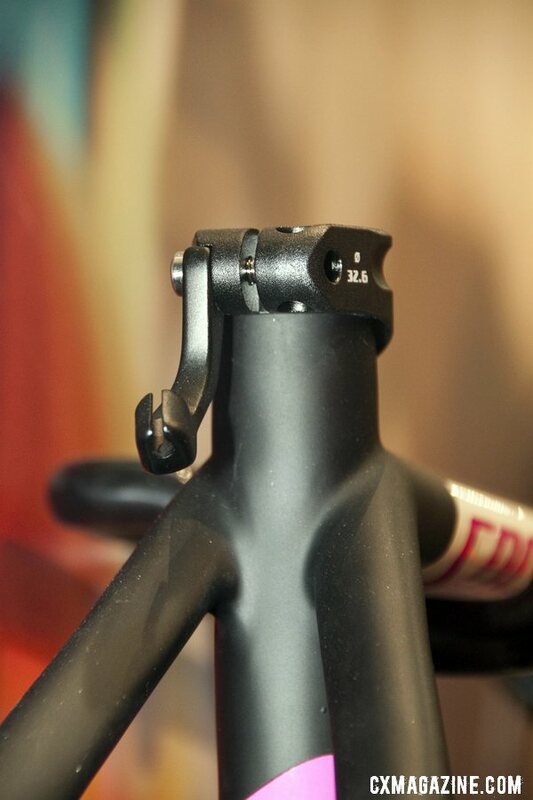 The decrease in lower steerer diameter was to reduce weight and reduce some front-end harshness. 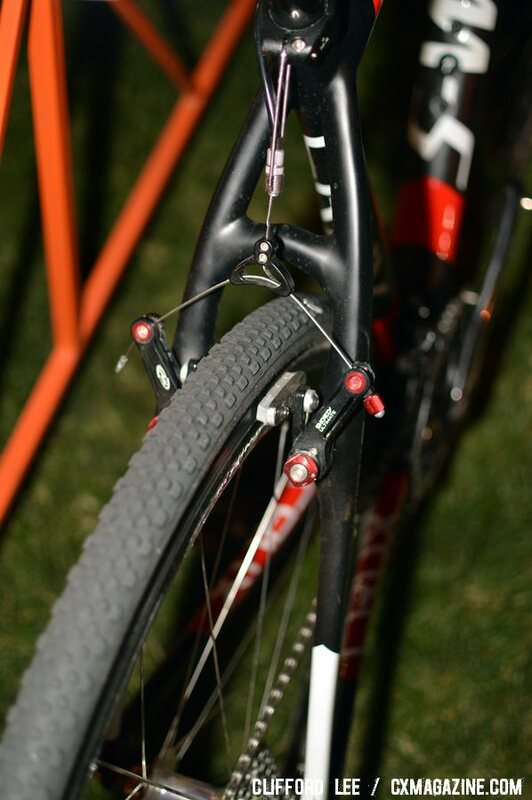 Specialized’s OSBB (PF30) is the bottom bracket standard of choice for all the Crux models. 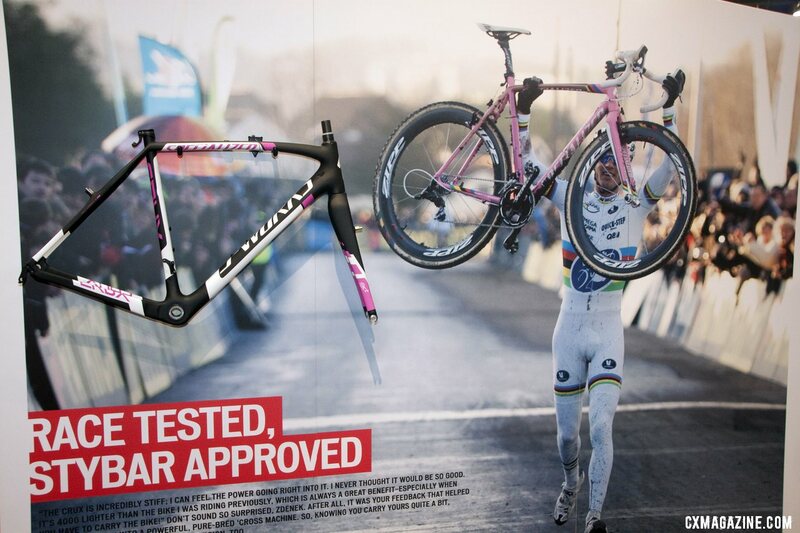 For 2013, there are two 2013 S-Works Crux carbon frames that will be sold as $3000 framesets only, in both cantilever brake and disc brake models. 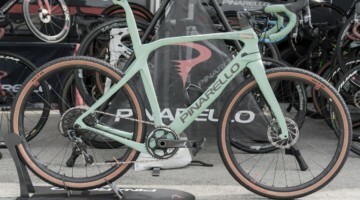 These frames are made from Specialized’s top-end FACT 11r carbon fiber, and result in frame weights reportedly under 1000g, with the disc model actually coming in lighter than the canti version. 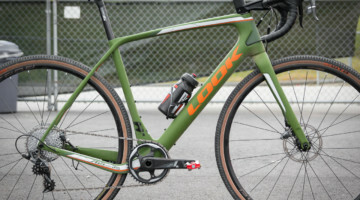 We saw Lea Davison race CrossVegas to a strong second place on her new carbon S-Works Crux, and will see 2011 World Champ Stybar and 2010 National Champion Todd Wells race this frameset later this season. 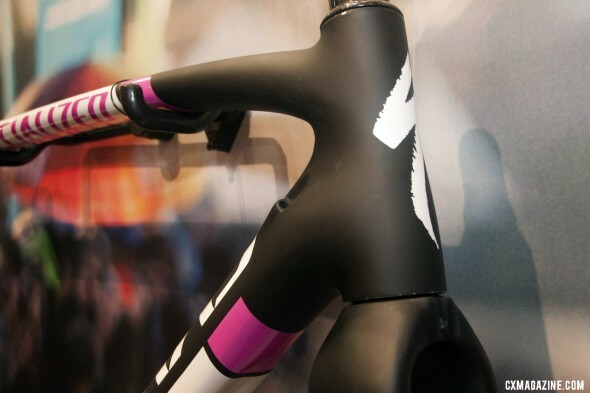 Specialized also offers the carbon disc and cantilever framesets in its FACT 10r carbon fiber as well for more affordable, slightly heavier options. The Crux Carbon Disc OSBB and Crux Carbon OSBB framesets retail for $2200 and are just 100g heavier than the S-Works models, and come in complete bike options in the form of the SRAM Force-equipped $3800 Crux Expert Carbon Disc and the SRAM Red-dressed $4400 Crux Pro Carbon. 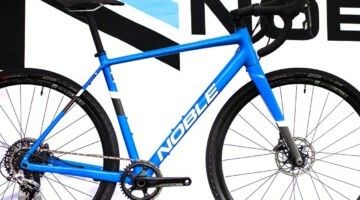 The company continues to offer its successful E5 alloy Crux models, with a $2200 Crux Elite Disc model and a $1850 Crux Elite cantilever brake model that both feature SRAM Apex drivetrains. Got your own parts? There’s a $990 cantilever E5 frameset option. Don’t miss our endless stream of cyclocross tech content from Interbike 2012. For more cyclocross bike specs and geometry including 2013 models, see Cyclocross Magazine’s Cross Bike Directory and Comparison Tool. Great bike, certainly love my 2012 e5 alloy. Hate the seat collar! I torqued mine to spec and the seat post slipped each time. Had to upgrade to a TRP seat collar during the build process.